the full length trailer for YOU PRIVATE PERSON, my first collection of short stories forthcoming from Scrambler Books (2012), is now live. Directed by Meggie Green, it also features Michael Inscoe. Much love and eternal gratitude to Meggie. She is magic. universal error published my short story 'deserters,' a part of a serial story called 'soap opera.' Much thanks and gratitude to Chelsea Martin. the best alt lit short stories republished by short story 'how to survive a car accident.' Much thanks and gratitude to Guillaume Morissette and Frank Hinton. 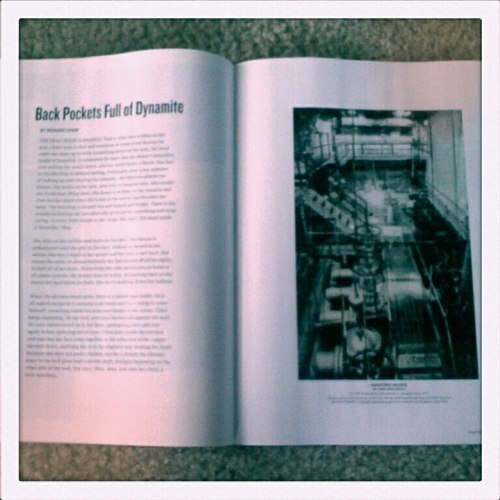 cityarts magazine published my short story 'back pockets full of dynamite' in their print September issue. The title is from the song 'Black Rainbow' by St. Vincent. Alexander Allison and Artifice Magazine interviewed me re YPP and other things here. Matthew Simmons and Hobart interviewed me re YPP and writing here. Lillian Ruth Nickerson and CityArts Magazine interviewed me re YPP and real life here. YOU PRIVATE PERSON is now available for preorder here. Goodreads page here. Small Press Distribution page here. to start to journal more here. The other day I realized it was October.